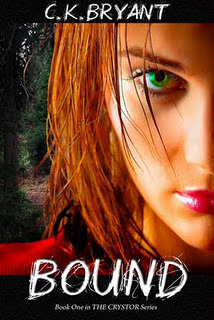 I'm happy to review the fabulous Christine Bryant's debut novel, Bound. Bound is the first book in The Crystor series. This first installment sets up the relationship and ties between Kira, Lydia and Octavion. There are several excellent scenes in Bound, but there were some parts when I wanted more . . . information or action. For most of the book I hated Octavion (he's abusive), but there were a few moments when I caught a glimpse of a better man on the inside. By the end, I was trying to decide if he'll stay a bad guy in my point of view or evolve into a good guy. I'm interested to see where the next book leads the trio. And yes, I'll definitely be reading the next book. I'm totally intrigued and want to know how Kira, Lydia and Octavion are going to step up and defeat the bad guys. You can read the 1st Chapter and purchase Bound on the author's website. I liked your review. It's always interesting to see what other readers take away from a book. I'll be doing a review on Bound a week from today. What Blessings Are in Your Book of Life?